Australia’s only top-level cycling team, Mitchelton-Scott have steadily evolved since making their debut in 2012. The team comprises both men’s and women’s line-ups, both competing in the UCI’s respective WorldTour calendars. Initially, the men’s squad found success in the Classics, team time trials and opportunist stage wins, but have more recently nurtured rising Grand Tour contenders and the next generation of sprinters in the shape of Caleb Ewan. Colombian Esteban Chaves and British twin brothers Simon Yates and Adam Yates have made a big impression on Grand Tours in the past few seasons. Chaves established himself as a serious contender during the 2016 Giro d’Italia, where he placed second overall and wore the maglia rosa for a spell. This was backed up with a third place in the Vuelta a España the same year. Adam Yates ended the 2015 season with a win in the Clasica San Sebastian, and finished seventh overall in the 2016 Critérium du Dauphiné, earning himself a spot on the squad’s Tour team. He finished the 2016 Tour in fourth spot overall, and claiming the white jersey of best young rider. Simon Yates’s season hit a setback in 2016 as he fell foul of the team omitting to submit a therapeutic use exemption certificate for an asthma drug, and he failed an anti-doping test at 2016 Paris-Nice. He was suspended from competition for four months, ruling him out of the 2016 Tour, but took part in the 2016 Vuelta to finish sixth overall. The following year, he lined up for the Tour de France and placed seventh overall – also taking the best young rider classification, a year after his brother. Ewan has been developing as a major sprint force, and will have his chance to contest flat stages of the Tour de France for the first time in 2018 having already claimed stage wins in the other two Grand Tours – a stage of the Vuelta in 2015 and the Giro in 2017. 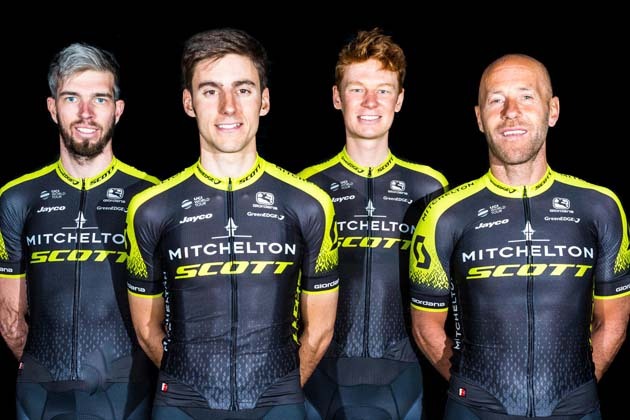 The squad changed its name to Mitchelton-Scott for the 2018 season after former title sponsor Orica decided not to renew its financial backing of the team. After breaking her knee at last year’s World Championships, Annemiek van Vleuten won Saturday’s Strade Bianche women’s race. Adam Yates will return to the Tour de France after the “mistakes and big disappointment” at the 2018 edition. Mitchelton-Scott's Matteo Trentin comfortably won an uphill sprint on stage five of Ruta del Sol as Jakob Fugslang sealed his overall win. Simon Yates was too strong for the peloton on stage four of the Ruta del Sol, powering away to win solo by almost 30 seconds. Esteban Chaves said “it is beautiful to be back racing” at the Volta a Valenciana after an eight month absence due to illness. during the 2019 Tour Down Under Classic on January 13, 2019 in Adelaide, Australia. Paris-Roubaix winner Mat Hayman may have retired from racing, but he will not be leaving the sport behind. Esteban Chaves will rejoin the peloton in February at the Vuelta a Valencia in Spain. Vuelta success brings Yates success, while Dutchwoman Annemiek van Vleuten is best woman. Mathew Hayman has announced he is retiring from racing after his home race at the start of next season.